Virtual reality has a truly astounding trajectory. The VR hardware and software market has already tripled in size in only two years. In a few short years, Statista predicts that the market size for virtual reality software and hardware will expand to over $40 billion. Only a decade ago, virtual reality seemed like a distant dream. Now it seems that VR is more than an outlet for escapism, entertainment, and media. It seems VR is poised to disrupt all sorts of business practices and even entire industries. For instance, healthcare, education, and journalism are experimenting with VR and related technologies. Telehealth companies are utilizing VR and robotics to help with training, surgeries, and mental health. Some educational institutions are using VR is similar ways, helping simulate certain situations using VR, AR, and MR technologies. Similarly, The New York Times has been releasing journalistic pieces that are far more visceral, engaging, and empathetic through the use of 360-degree cameras. 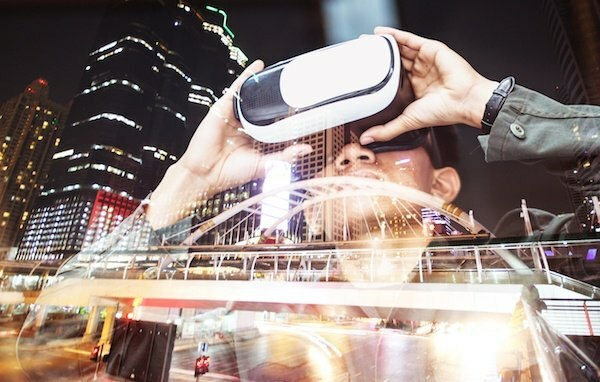 Businesses are beginning to use emerging and growing technologies like VR, AR, and MR to help with their marketing goals and branding efforts. Swedish furniture giant Ikea is using AR to help customers interact with their products from home. With the Ikea AR app, users are able to place accurate 3D renderings of Ikea furniture within their own homes. This means the mundane task of measuring your space for new furniture is eliminated. You can simply use the Ikea app to place objects in your space. The chance of bringing home a piece of furniture that doesn’t quite fit is reduced enormously. Even more importantly: the AR app fosters a greater connection with the Ikea brand. Not only does the AR app help the user address design, space, and other practical considerations of buying furniture, it also provides a certain amount of entertainment value. Wayfair, another furniture retailer, provides a similar AR application: simply drag a piece of furniture into your space using just your smartphone camera. It’s an ingenious way to boost brand loyalty, memorability, and increase consumer satisfaction with your products. Home design isn’t the only place we’re seeing AR applications pop up, either. Sephora, the high-end makeup retailer, launched an AR element to their existing smartphone application. With the Sephora app, users are able to try on different makeup looks, access makeup tutorials, and share their virtual makeup adventures with others by snapping AR-enabled photos. Within the same app, users are able to access Sephora’s loyalty program, browse makeup selections, and make purchases. By integrating the AR application, and embedding it within the existing Sephora smartphone app, the makeup giant has been able to revitalize its digital marketing and branding efforts, appealing to younger and older generations at the same time, all while the AR tech is still novel and fresh. The user experience is greatly enhanced, and therefore, the perception of the Sephora brand is bolstered. The New York Times is using VR to tell stories in an entirely different way. Ikea and Wayfair are attempting to make shopping for furniture a much simpler process with their AR smartphone applications. Brands like Sephora are making shopping for makeup a more social, engaging, and entertaining experience through their AR-enhanced beauty applications. These uses of VR, AR, and MR are helping establish new ways of communicating with customers. These experiments may help pave the way for more value-driven marketing and branding efforts while helping promote new and interesting types of technology. Innovations in AR, VR, and MR are bound to continue to shape how we interact with media, businesses, and brands. As these technologies evolve, and as we learn how to best employ them, how we view entertainment, consumerism, and branding will likely change. At present, a few established organizations are beginning to play with the manifold opportunities VR presents. It’s uncertain how VR will fit into companies’ marketing lexicon. At the moment, the adoption of emerging and growing technologies is slow. Established brands have the room to experiment with AR and smaller businesses have an opportunity to learn from these high-tech branding efforts. How digital marketing will be affected in the years to come isn’t something we can predict at the moment, but as the technology develops, will certainly begin to see where the path is leading.